Today an interview which will put a smile on the faces of the hammock community: I was able to get Brandon Waddy from Warbonnet Outdoors away from his sewing machine and have him tell us his story. It is interesting to hear his tale, and I suggest you lay back in you hammock or hanging chair while enjoying this interview! 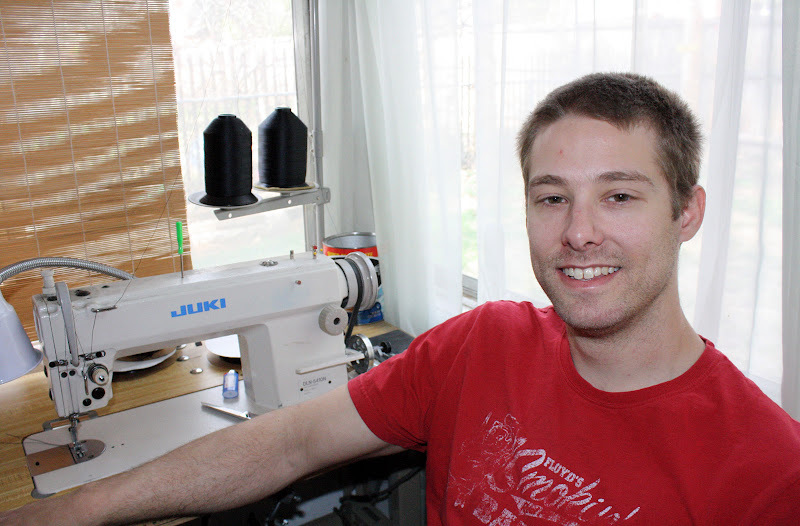 Brandon and his sewing machine "Juki". Brandon, please briefly introduce yourself and tell us who you are. Since when are you backpacking, and how did you start? How often are you out backpacking nowadays? My name is Brandon Waddy, and I’m the owner of Warbonnet Outdoors LLc. I currently make gear that is almost exclusively geared towards lightweight hammock camping. I’m located in Colorado USA at the foothills of the rocky mountains. I started camping in a hammock almost 10yrs ago. I fell in love with it after the first night and never looked back. I do get out to hike and climb occasionally, but have always considered myself more of a climber than a hiker, although I’ve been so busy lately that I’ve been doing neither very much. I look at it as “paying my dues” and hopefully I’ll have plenty of free time in the future for both. I also enjoy mountain biking, slacklining and snowboarding. I’d consider myself a lightweight hiker with a baseweight around 12-14 lbs for 3 season hiking, but I don’t keep track of it too tightly, I just try to pick lightweight items and not worry about it too much beyond that. Warbonnet Outdoors is the inventor of the very popular Blackbird Hammock, Big Mamajamba tarp and Yeti Under Quilts & Black Mamba top quilts. Can you tell us a little bit about the beginnings of Warbonnet Outdoors, the birth of the Blackbird hammock, and how the company developed over time? 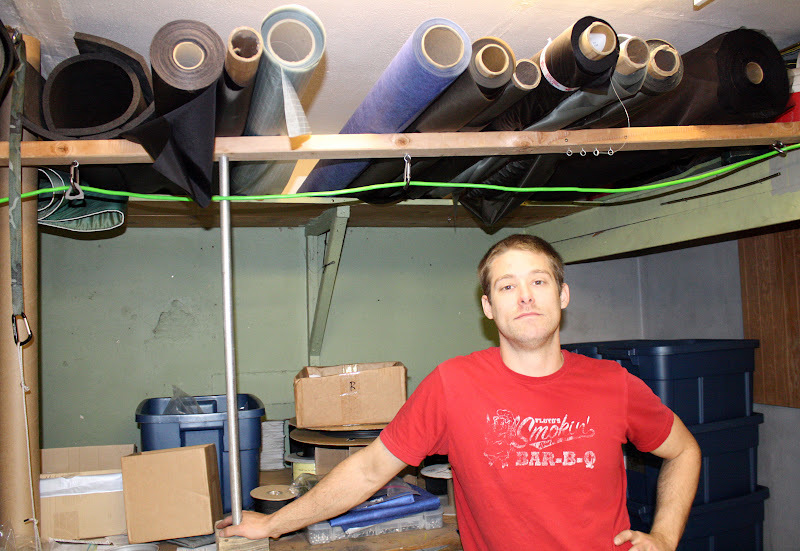 I technically started the company about 3 years ago, however, I had been working on getting my designs and sewing skills up to par for a couple years prior to that. My official “grand opening” was at Trail Days in 2007. I introduced a hammock and tarp, and a few “prototype” underquilts (the forerunner to the Yeti). I ran into patent issues with another manufactuer right away and had to halt sales and re-group. That sidelined the business for about a year and a half until I introduced the blackbird in late 2008, so I’m still a very young company. I’ve slowly but steadily introduced new items since then. Brandon, we love to be let in on the work-in-progress stuff! Can you let us know a on what kind of new products you are working at the moment? As far as works in progress, I could tell you but I’d have to kill you, so I’d better not :) I will say that I love designing gear, so there’s almost always something that I’ve got rattling around in my head. What is the most sold piece of gear from Warbonnet Outdoors? Also, where do your customer come from? My best selling piece of gear is the blackbird hammock, which probably comes as no surprise. The tarps and quilts are selling well also. My customers are mostly from the US and Canada (probably simply because that’s where I’m located), but I’ve sold to customers in most of the eastern European and Scandanavian countries, as well as Australia, New Zealand, and others. I do have contact with some of the other cottage manufacturers, mostly through the internet and telephone, but also at trade shows like Traildays. What is your own favorite backpack, hammock, tarp and sleep system? I’m currently using an old mountainsmith pack for most stuff, but am looking at getting either an Aarn pack or possibly an ULA. I usually grab the single 1.7 (or sometimes the double 1.1) Blackbird and the appropriate yeti underquilt and mamba topquilt for the season. When and where was your last longer backpacking trip, and what was your baseweight? Are you planning to get out for a trip soon, and enjoy the late winter season in Colorado? Like I mentioned above, I’ve not gotten out much at all lately. I did get out for a winter campout with some friends in Feburary, but it was a vey lazy trip. Basically car camping with alot of eating and drinking. I’m hoping to have time to get out on a few trips this summer. Some friends are talking about a remote multi-day whitewater rafting trip in june somewhere in the Colorado rockies. Seems to me like lightweight backpacking is quite popular already, and there will always be those that take it to the extreme with SUL methods. I personally like the idea of “comfort weight”. It seems like everything is getting lighter though, but i don’t know if the majority of backpackers will ever adopt SUL methods, that is probably something that will stay in the minority simply because of what has to be given up to achieve those numbers. I can see more people in the UL category in years to come. With new gear it’s pretty attainable without having to give up so much. Carrying a lighter load and thus being more comfortable in the backcountry is an easy choice for most folks, at least to a certain extent. It (UL) seems like the logical choice for backpacking and I could definitely see it becoming more mainstream in the near future. As for hammock camping, I do think it’s destined to catch on in the mainstream as well. Things take time to catch on, but similar to lightweight backpacking, it’s a logical progression that’s based on more comfort and convenience with little weight penalty. That’s why I switched, and it's why hammocks are catching on. Brandon, I thank you for taking the time to answer my questions!